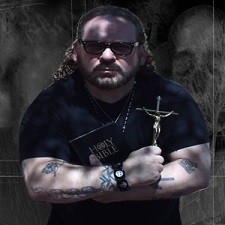 Reverend Shawn Whittington is a devout Catholic and a trained, registered Ordained Spiritual Warfare Minister. His wife Sharon is a near death experience survivor, a certified Stephen Minister through her Lutheran faith, and a sensitive/ intuitive. (Both have suffered and survived severe demonic attacks.) They are a husband and wife ghost busting team based in Las Vegas, Nevada with over 40 years combined experience. The team is fully equipped to perform a thorough paranormal investigation if needed. But, Ghost-B-Gone strives to go one step further than just ghost hunting. They specialize in getting rid of that extra unwanted guest in your home. Ghost-B-Gone has helped many Las Vegas families over the years get their lives and their homes back. Trouble of a paranormal or demonic nature can be quite disturbing, and unless you have gone through it yourself, you can't quite know what it is like. He is the host of Vegas Supernatural on www.KCORradio.com. He has invited me to be on his show this Monday night from 7-9 CT and I CAN NOT WAIT!!!! If you are looking for a DIFFERENT KIND of talk show you have GOT to listen to his!!! He has the MOST interesting guests and he has such GREAT insight to the paranormal that you WILL NOT be disappointed. Join us for a little Halloween fun. Let's talk about some SCARY STUFF and well.....stuff we just CAN'T Explain!!! Mark your calendars!! !